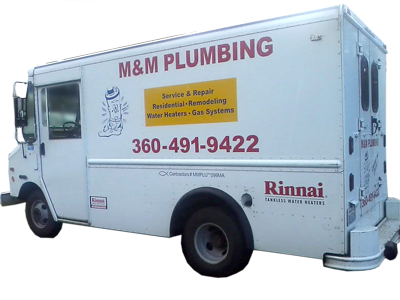 When you need a reliable Olympia plumber to take on your next project, an experienced technician from the team at M & M Plumbing can help. As an established, locally owned and operated business, we are dedicated to the complete satisfaction of all of our customers. Our technicians always strive to go above and beyond to meet your needs. At our company, we consistently offer excellent service on every job that we take on. No matter the scope or the size of the project, we will work hard to provide you with high quality results. Whether you need a complete plumbing overhaul or you simply need to fix a showerhead, we are the crew you can trust for personalized service. At times, plumbing work may seem like a simple fix, but those jobs can quickly turn into a complicated matter that's best left to a professional. Don't take any chances with do it yourself fixes when our team of professionals can handle the job for you. For an experienced plumber in the Olympia area, you can rely on our skilled technicians. Call M & M Plumbing today, and let us tackle your plumbing issue for you. Which Way Should You Run Your Ceiling Fans? Garden Hoses: Are They Safe for Drinking? Technicians Available In Your Area. Join our email list for updates and current specials. All Content Copyright M&M Plumbing.